The 2011 Christmas season is just about here. Most people start preparing for Christmas just after Thanksgiving. This year, I started preparing in August! And let me tell you, I've been busy getting ready for this year's Christmas since then. Over the past years, I've been using a store bought electronic music box that synchronizes Christmas lights to canned music - mostly traditional Christmas songs that sound more like karaoke tracts. While it did make for a more interesting light display with its eight channels, it was lacking any means to add music, change the light sequences or include special effects like intensity control, shimmers, twinkles, macros, device and RGB color control. For this 2011 season, I made the decision to step up to professional stage lighting controllers with computer run sequencing software called "Show Time S3" by Light-O-Rama. To save some money, I purchased the controllers as kits, soldering all of the computer chips, triacs, resistors, transformers, capacitors, and wires to the circuit boards myself. The controllers can do programmable special effects, DMX control, servo control (for gobos and other motion control devices), X-10 device control, etc… Things should get interesting in years to come. 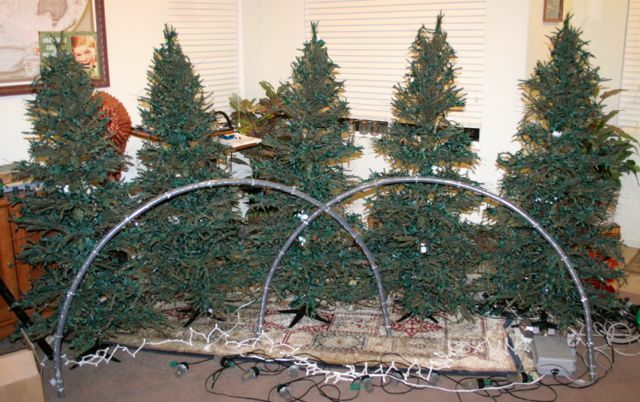 Five artificial Christmas trees which change colors under computer control - each tree having 1,500 lights (500 red, 500 green, and 500 white). Two five (5) foot arches capable of 16 million colors for special lights in motion sequence. They will accent the light sequences being run by the five trees above. A red and green special effects stage laser for back wall lighting effects. "Curtain" strobe lights for fantasy effects. Six colored floods for color wash effects. 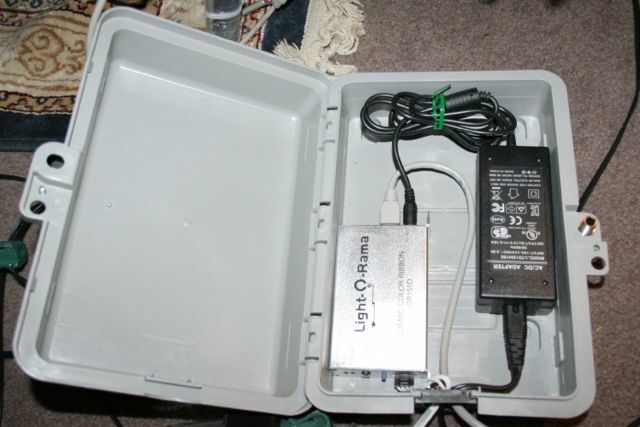 A low power FM stereo transmitter to transmit the audio portion of the show so as to not annoy the neighbors with sound blasting from my front yard. Why am I going through all of this expense and trouble to put together a computer synchronized light show? There's really two answers. First, I love Christmas and since a child what I loved almost as much as the presents was the lights. There's an artistic side of me that desires to combine technology with light. Christmas is the only time of the year I can put on an artistic light show synchronized to music without being kicked out of the neighborhood. The second and perhaps more compelling reason is I noticed that over the past few years, since the resession started, there have been noticeably few Christmas decorations in my neighborhood. Simply put, people are so financially strapped and concerned over the economy and their personal situations they just aren't getting in the holiday mood. Last year, I had several neighbors come over and share with me that my light show really lifted their spirits and made the holiday more enjoyable. The street in front of our yard was somewhat of a gathering place for neighbors and their children. Some neighbors even got a little involved, making suggestions on what to change and how to improve the show. Many of those suggestions were taken to heart and prompted me to switch from the canned store bought Christmas music and lights product to a full blown computer controlled professional lighting control system that gives me the flexibility to choreograph the show with my own personal touch. I hope to get the neighborhood into the Christmas spirit and draw the community together.. In August, I selected ten songs that I wanted to choreograph with lights. Since then, I've been using my spare time to "sequence" the light channels to the music. The software that I'm using has an animator that allows me to see what the show will look like virtually. I've also been wiring the trees and lasers, which has been a huge job. Each tree has taken me several days to wire and string with the 1,500 lights that are needed - 500 lights per color channel. A photo of the five trees under construction and functional testing in my front room. The arches can be seen in front of the trees. They'll be off to the side of the trees once set up - there's only so much space in my front room. A closeup photo of the lights as I've been tie wrapping them to each branch of the trees. There's 15 strings of lights per tree in three different color channels, totalling 1,500 lights. It's a lot of work just to string one tree. The laser servo motors have a narrow temperature range they can operate under so I had to build an enclosure with a small heater and thermostat to keep them up to proper temperature at night when the temperature drops below their operating range. Christmas lights are hard to buy in August so I placed an order for 93 additional strings of lights from a wholesaler. Bying wholesale I got some excellent prices - much lower than what you'll see in the stores. I also needed to order the five artificial Christmas trees in August from another wholesale distributor. Curiously, one of the five trees was confiscated by the U.S. Government during shipping. I guess they found a shipment of five Christmas trees in summer was suspicious for some reason. I finally got the confiscated tree in late September. 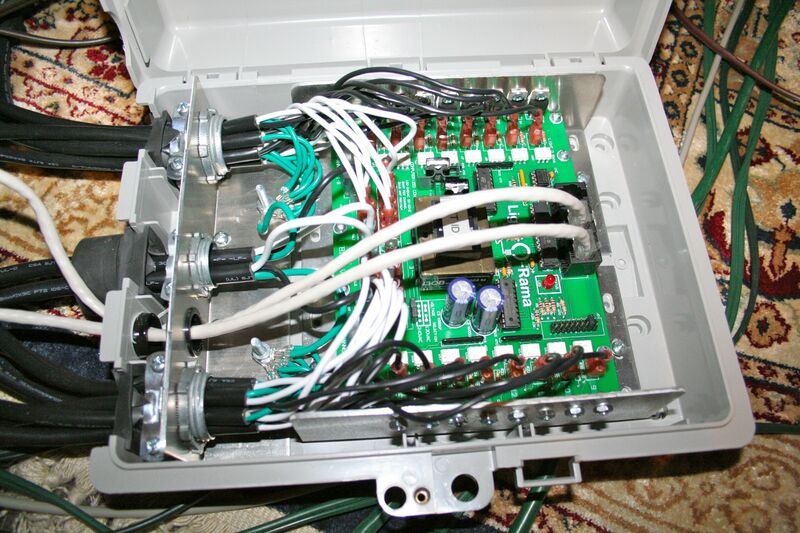 One of two 30 Amp, 16 Channel light controllers that I built. These controllers will run the larger strings of lights on the eves of my house, bushes and trees. They will also run the strobes and lasers..
150 channel controller for the two arches. The arches were the hardest part of the show to sequence to music as each arch has 25 RGB LED's (three channels per LED, totalling 75 channels per arch or 150 channels for both arches). Each of the three color channels per LED has to be individually sequenced to the music. 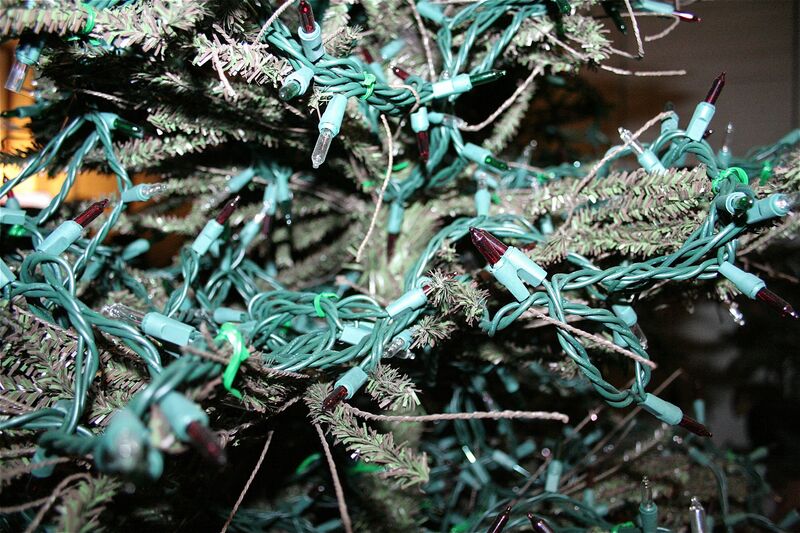 You're probably wondering about the electric bill to run 10,000+ Christmas lights. You may be surprised to learn that I'm actually using less electricity than many traditional Christmas light setups you'll see around your neighborhood. Why? 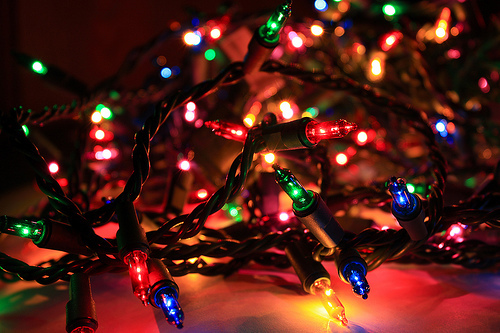 Most traditional Christmas light displays are on 100% of the time, consuming electricity all night. Each individual light in my display is on only about 20% of the time (some much less) because it is being turned on and off by computer in sequence to the music. The show is programmed to run only from sunset to about 10:00 PM. After that, it's lights out. I estimate the cost in electricity to run the show will add up to maybe $25.00 for the entire month they'll be running - about the price of a cheap dinner at a take-out, to put it into perspective. In past years I didn't video tape the light shows because, while more interesting than traditional Christmas lights they weren't worth writing home about. This year, however, I plan to video tape the shows and post them on my video page. For Christmas 2012 (yes, I'm already thinking about it), I'm tentatively planning on adding two more arches, two additional computer controlled trees, and changing out my non-color changing lights in my bushes and eves for lights capable of computer controlled colors to have better control over the colors of every item in my display. I'll need to add an additional 182 light channels to my sequence to accomplish that. We'll see how comes together next year. More on Christmas 2011 later as I get the show setup.